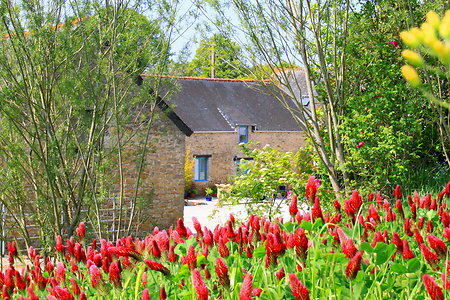 Get 20% OFF BRITTANY FERRIES when you book your holiday cottage in Brittany with us!! Don't delay - summer crossings sell out QUICKLY!! Guests often return to our Holiday Cottages in Brittany year after year because we offer quality holiday accommodation and excellent value for money. We are family friendly, accommodating and love what we do. 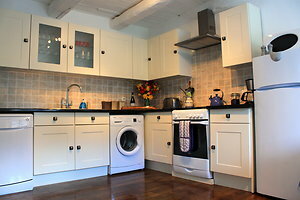 Our guests tell us that the photos don't do the cottages justice at all! Two luxury gites set within a stunning, tranquil location, but only 3 minutes drive from two restaurants, small shop and a beautiful lake! Located in the heart of the Morbihan, Southern Brittany and close to the medieval village of Guemene-sur Scorff. The large, attractive town of Pontivy is 25 minutes away. Our glorious hamlet of ancient granite cottages is the only property at the end of a private lane, surrounded by beautiful countryside & wildlife; without any overlooking neighbours & no passing traffic noise to interrupt the tranquillity and birdsong! 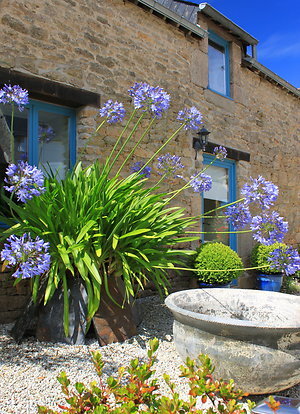 Our two self catering holiday cottages are set within a sunny courtyard full of charm & character. Totally independent from one another, each comfortable cottage has a private sunny garden and sole use of the large Jacuzzi every day. 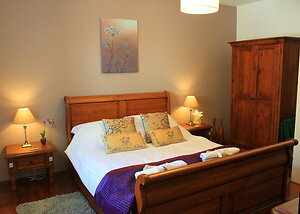 It is our aim is to provide our guests with comfort, quality and tranquillity. Looking for some R&R in a fabulous location, with a little 'boutique Brittany' luxury? It's all here at Brittany Spa cottages! Enter into a large sunny, gravel courtyard where the buildings form a spacious ‘U’ shape. It always gets a "WOW" from our guests when they arrive! Our two self catering holiday cottages are totally independent from one another and situated on opposite sides of the courtyard. To the rear, each holiday cottage has a spacious & private sunny garden, fully equipped with quality wooden furniture, sun-loungers, parasol & BBQ etc. We live in our cottage at the back of the courtyard & therefore onsite to help in any way we can, but always keep our presence discreet & unobtrusive. Spring time in Brittany! Any time is great to visit! Anytime is a fabulous time of the year to visit Brittany and Spring is around the corner! Though the weather will be hard to beat the wonderful Spring and Summer we had in 2018! We look forward to welcoming our guests all year round. 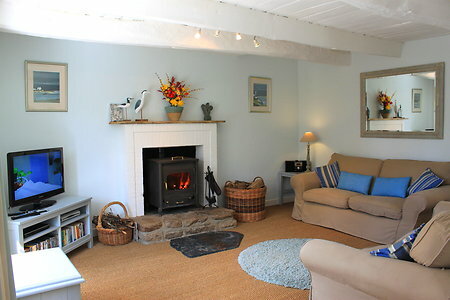 Come and stay in one of our warm and welcoming luxury cottages! We maintain our private hamlet throughout the year and have enjoyed welcoming our lovely guests in all seasons. Our guests have given excellent feedback and many have already booked for 2019! Check out our reviews! The cottages book out quickly and we are looking forward to meeting more lovely guests, so don't leave it too late to bookPLEASE bear in mind that the popular ferry crossings and more importantly the cabins, sell out VERY QUICKLY. We don't want our potential guests to miss out on their preferred dates with us as they are unable to secure the crossing and cabin that they want. Don't forget to ask about the 20% discount code for Brittany Ferries! The large Hot Tub Jacuzzi! 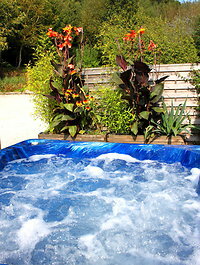 Each luxury holiday cottage has private use of the Hot Tub every day! The Jacuzzi has been screened to make a private and is the perfect place to relax and let the hot tub bubbles massage and relax you, especially after a hard days sightseeing in Beautiful Brittany! Unlike a swimming pool, the jacuzzi remains open and bubbly hot all year, and is enjoyed by all. Towels, slippers and spa robes are provided. The hot tub is maintained daily, ensuring that the water is always well balanced & crystal clear. HOT TUB TOWELS SUPPLIED. HOT TUB OPEN ALL YEAR!! Our Guest reviews say it all!!
" We loved the hot tub when we returned to the cottages after a day out. It was private, peaceful and relaxing"
" The hot tub was clean, welcoming and blissful. Very relaxing, private and enjoyable"
FREE WiFi internet access - iPOD dock, Hi-Fi & DVD player. Quality beds & luxury linens - Modern kitchens & bathrooms. Generous welcome pack & complimentary toiletries. 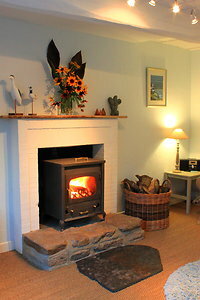 Electricity & 1st basket of logs included in the holiday rental (Logs Mid- September to end of March only) price! Travel Cot with mattress, blankets, baby bath, change mat & high chair available. Private rear gardens with outdoor furniture & BBQ’s. Daily Private use of our well maintained HOT TUB JACUZZI. Towels, slippers and spa robes provided. Meals available on request- fresh and home cooked to order! 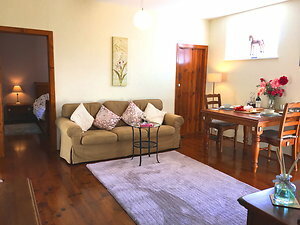 Much care and attention has gone into the styling of each holiday cottage to provide accommodation that is equipped & furnished to a high standard, but above all else, comfortable. Flat screen TVs, free WiFi, Super COMFY beds, clean, fresh linens, soft towels, spa towels and robes, complimentary toiletries and a generous welcome hamper are all included in the price of your holiday rental and go towards making our beautiful cottages in Brittany extra special. You just have to read some of our guest reviews to be sure of how well you will sleep here! Guests staying at Brittany Spa Cottages have found our location to be a great base for exploring & discovering the many & varied attractions Brittany has to offer. Perfect for families who like to explore. Perfect for couples looking for a romantic getaway or honeymoon! Perfect for walking & cycling holidays. Perfect for active people who want to have a go at anything from sand yachting, scuba diving, canoeing, sailing to even quad biking. Perfect for ‘not so active people’ who like to visit historic towns, villages & châteaux shop in the local markets, take long beach strolls. And of course sample some of the excellent cuisine Brittany has to offer. Looking for a great holiday? Brittany has it all!! Slow down and imagine a place & time when the people were friendly, the roads were empty, beaches uncrowded and Sundays were Sundays! It still exists, here in the Morbihan, Southern Brittany! We are committed to helping you have a great holiday. Always happy to help, advise and guide you. Our aim is for you to truly relax, enjoy and leave feeling rested and wanting to return. Our private hamlet is situated in the green & rolling countryside of the river Scorff valley, Southern Brittany. Located only 3 minutes drive from Langoelan where you will find 2 restaurants - a pizzeria and a classy French Bistro serving excellent local cuisine, Click here for more details. The village also has a small shop for basic provisions and beautiful Lake - Etang Du Dordu. There are a few swings & a slide for the little ones, and a boardwalk nature reserve attracting many birds & other interesting wildlife. There is a small café by the Lake open May to end of September where you can enjoy an ice cream, beer or glass of wine. Take along the Boules or croquet sets available at the cottages and play away. Enjoy fishing on the lake or simply take a stroll or cycle around its shores. Our cottages are close to Guemene-sur-Scorff, (10 minutes) a pretty medieval village which has a number of restaurants, shops and a large supermarket just on the edge of town. 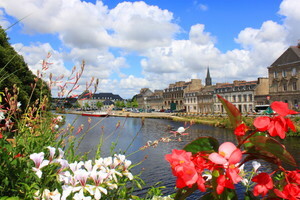 And Pontivy (25 minutes)a large, attractive historical town where flower adorned bridges criss-cross the Nantes-Brest Canal. Pontivy has many restaurants, shops and pavement cafes as well as 5 large supermarkets. 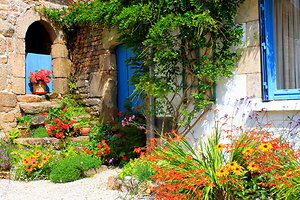 Click here to see more detailed info about the location of our gites in Brittany. Click here for detailed information on what we provide and arrival evening meals. Both of our self catering cottages are perfect for a romantic break in Southern Brittany! Ourluxury holiday Gites in the beautiful Morbihan area of Brittany are proving to be a very popular Honeymoon destination. Bubbly waiting for you of course! 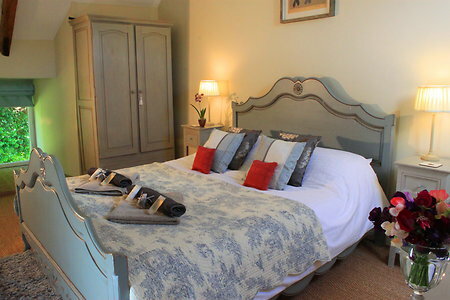 Orchid Barn couples cottage, with its one bedroom & huge Oak Sleigh bed, is the perfect romantic retreat! – be sure to book early to avoid disappointment! 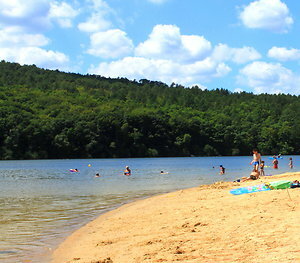 Our nearest sandy beach can be found at the Lac de Guerledan, 30 minutes drive from your cottage. This pretty beach is considered to be one of the best inland beaches in the whole of France. The huge & stunning lake is surrounded by a beautiful forest, which has many scenic walking and cycling trails. The lake has a number of water sports centres, restaurants & bars. Slightly further afield you will discover that Brittany has one of the most stunning coastlines in France and Europe. From sheltered little coves & bays to huge stretches of family friendly sand to windswept surfing heaven. Southern Brittany has a great choice for both families & water sports enthusiasts. Le Pouldu, Larmor Plage and Guidel plages are our closest coastal beaches just under an hour away. 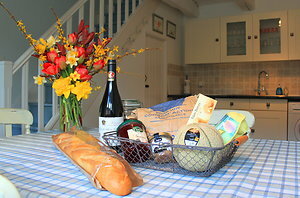 A warm & genuine welcome awaits you here at our luxury cottages in Brittany! You check us out on Google and Google for reviews.